Fully Supported Language: For “Fully Supported Languages”, translations are available out of the box for standard objects and fields, setup menu & help articles. Languages that fall in this category include English, German, French, Chinese (Simplified & Traditional), Japanese and others. End-User Languages: For “End-User Languages”, Salesforce provides translated labels for all standard objects and pages, except administrative pages, Setup, and Help. Languages that fall in this category include Arabic, Greek, Polish, Herbew, Indonesian, Vietnamese etc. Platform-Only Languages: For “Platform-Only Languages”, no out of the box translation but you can translate items such as custom fields, custom labels, picklist values etc. Standard objects and fields can be renamed, but not translated (there is a difference between the two). And languages that fall in this category include Hindi, Bengal, Malay, Urdu, Albanian, Armanian & many others. 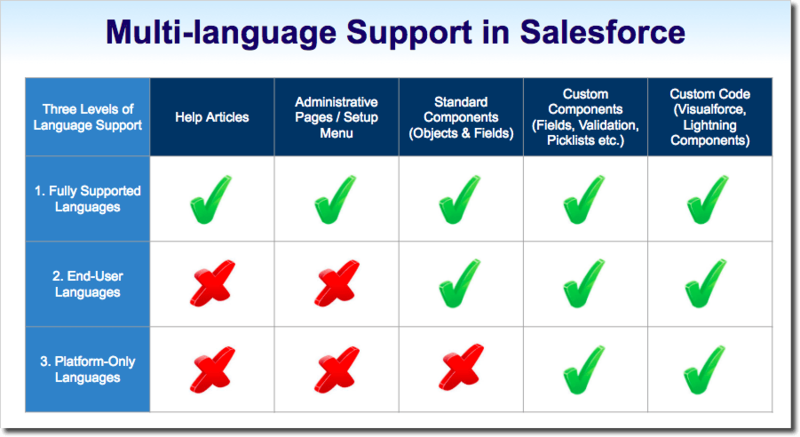 Now let’s take a look at how do we actually set up and configure Salesforce for different languages. Step by step.